Making a suncatcher is an excellent way to begin learning the art of stained glass. You can try out the basic techniques like copper foiling and glass cutting on a small scale and perfect your skills. What's more, you'll be creating something beautiful to catch the light and brighten your home. You can find most of these tools and supplies at your local stained glass supply store. 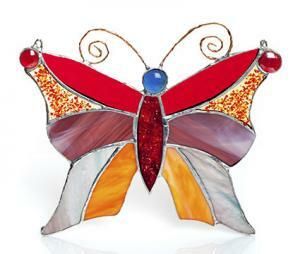 You can also shop online at stained glass specialty suppliers like Delphi Glass and J. Ring Art Glass. Choose a stained glass pattern that is appropriate for beginners. It should be numbered for you, but if it isn't, number each piece in the pattern. Photocopy your pattern so you have at least two copies. Set one copy aside for assembling your suncatcher. Lay out your pattern on your work surface. Cut the pattern according to the instructions. You'll want to cut each piece on the inside of the lines. Place each paper piece face down on the glass, smooth side up. Trace around each pattern piece using the black marker. When you cut the glass, you'll need to score it from one edge to another edge. Keep this in mind as you transfer the pattern to the glass. Fill your glass cutter with oil. Holding the cutting blade perpendicular to the glass surface, score the glass pieces of your pattern. Put on safety goggles and gloves, and use the running pliers to break the glass after each cut. You'll need to make several cuts for each piece. As the piece is finished, use the marker to label it with the appropriate number. Fill the grinder reservoir with water according to the manufacturer's instructions. Wearing goggles, carefully grind the edges of each piece of glass to ensure they exactly match your pattern and are no longer sharp. Unroll enough copper foil tape to go around the first piece of glass. Use the shears to cut it to size. Remove the paper from the back of the tape to expose the adhesive. Carefully wrap the tape around the edge of your glass piece. Ensure the tape wraps around the edge and slightly covers the front and back of the glass. Smooth it down carefully. Repeat with each piece. Cut the lead came to fit the outside of the suncatcher according to the pattern. Hammer a row of nails into the plywood piece and wedge one came edge against them. Repeat with a second side of the suncatcher, so that you have two lead came pieces framing two sides of your pattern. Place your pattern inside the came pieces on top of the plywood. Arrange your glass pieces according the pattern, ensuring they fit well. Place the other two lead came pieces along the remaining two sides, nailing just outside the edges to hold them in place. Following the manufacturer's instructions, paint flux on each copper foil seam between the glass pieces. Work methodically, and make sure you have flux everywhere you plan to solder. Using the soldering iron, carefully apply solder to the seams. Avoid getting too much solder on the piece, while making sure not to create bubbles or lumps. When you're done, wait about 20 minutes to let the solder dry and cool. Remove the nails and the lead came pieces that were holding the glass in place. The glass should stay together on its own now. Gently turn the suncatcher over. Apply flux to all the seams on the other side, and solder them carefully. Decide on the placement of your eye holes to hang the suncatcher. Solder each eye hole in place. When the piece is cool, use steel wool to smooth out the soldering and ensure it has a uniform appearance. Avoid scratching the glass as you work with the steel wool. Use a rag to apply the patina solution to the soldered areas according to the manufacturer's instructions. The patina solution will turn the metal dark. Thread monofilament through the eye holes and hang your piece as desired. Wear clothing that you are comfortable getting dirty. You should choose a top that has a higher neckline and long sleeves, long pants, and shoes with a closed toe. Wear safety goggles to protect your eyes. If you wear eyeglasses, choose goggles that will fit over your regular glasses. Work in an area with good ventilation to avoid breathing contaminated air. Also choose a spot that's far away from pets and kids. Always use great care when cutting and handling the glass. The tiny shards that fly off when you cut it are extremely sharp. Don't eat or drink anything while you're working on your suncatcher. Pay attention to what you're doing as you work. If you're feeling tired or distracted, take a break from your project. Sometimes, you need to see the glass cutting and soldering process in action. These videos can help you refine your skills as you work on your suncatcher. This video from Susie's Stained Glass goes over the process from start to finish, and it's easy to follow. This short video will help you refine your glass cutting skills. In particular, it focuses on the difficult technique of cutting curved lines. This helpful video covers soldering your stained glass suncatcher. 111 Stained Glass Panel and Suncatcher Patterns by Donna Roberts - This ebook in PDF format includes dozens of free patterns you can use to create that perfect suncatcher. Many patterns work for beginners. Delphi Stained Glass - This stained glass supply store has a great selection of free patterns you can download to make your suncatcher. Patterns are appropriate for all different skill levels. Karen's Suncatchers Corner - This site has a comprehensive listing of free suncatcher patterns available for download. Many are suitable for those new to the art of stained glass. Only create pieces you can cut. If you make a pattern with a lot of complex curves or impossible shapes, you'll end up discouraged. Draw your pattern in pencil first, and then trace over it in marker. Remember to account for the soldering lines in your pattern. Measure a piece you've done, and choose a marker with that width. Then use that to draw your design. Number your pattern so it will be easy to keep track of the pieces as you're cutting. A stained glass suncatcher is a great beginner's project, and it's also extremely rewarding. You'll be able to admire your work every time it catches the sunlight, and you'll receive lots of compliments on your beautiful design.